London Socialite and friend of King George IV, the Duke of Strathnarn enjoys his London life is reluctant and resentful when he inherits from his hated father the title and onerous responsibilities of Chieftain of the Clan McNarn. Arriving bitterly angry in the highland fiefdom he fled as a youth, he’s faced with a terrible dilemma. To free his young nephew and heir from the clutches of his Clan’s mortal enemies, the Kilcare’s, he must marry Cola, the daughter of their fearsome Chieftain. Appalled, he complies with bad grace, but refuses even to look his young bride in the face, so certain is he that she will be coarse, uneducated and unattractive, so unlike the sophisticated beauties with whom he is wont to dally in London Society. Soon, however, a terrifying plot against the King involving a sinister poisoner and her deranged and vengeful son unfolds and it is Cola, aided by a ghostly Grey Lady, who comes to the rescue. 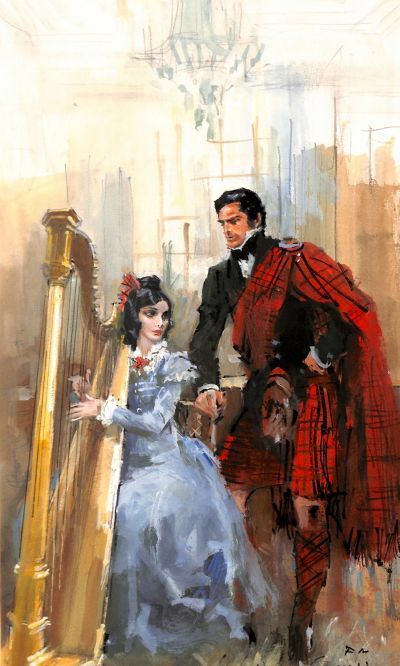 Only now, after so terribly misjudging and ill-treating her, does the Duke see his bride for what she is a raven-haired, musically talented and courageous beauty. But is it too late for their marriage of convenience to be transformed by the blessing of true love?